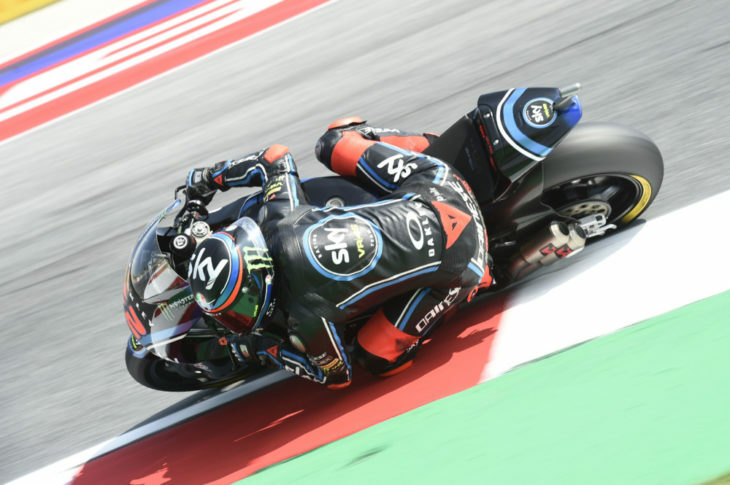 Points leader Pecco Bagnaia (SKY VR46 Kalex) took a fifth pole position of the season, his first in Italy, in a record-breaking Moto2 session, with the first 20 within one second of the Italian rider. “I’ll try to make a break early tomorrow, but I think it will be a tough race because the front tyre goes down a lot after 10 or 12 laps,” he said. His closest rival, he thought, would be second-fastest Marcel Schrotter (Dynavolt Kalex); but his title rival Miguel Oliveira (Red Bull KTM) was barely half-a-second away, on the far end of row three, in ninth. Third on the front row as veteran Mattia Pasini (Italtrans Kalex); with Fabio Quartararo (Speed Up) heading row two from Red Bull KTM’s Brad Binder and Spaniard Jorge Navarro (Federal Oils Kalex). Second SKY VR46 Kalex rider Luca Marini was seventh, and Alex Marquez (EG-VDS Kalex) eighth. 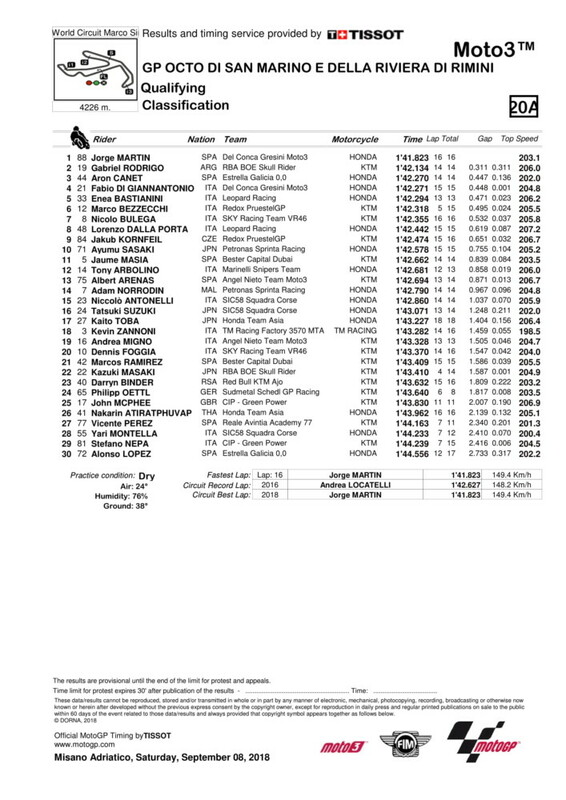 Remy Gardner (Tech 3) was 19th; American Joe Roberts (NTS) 26th. 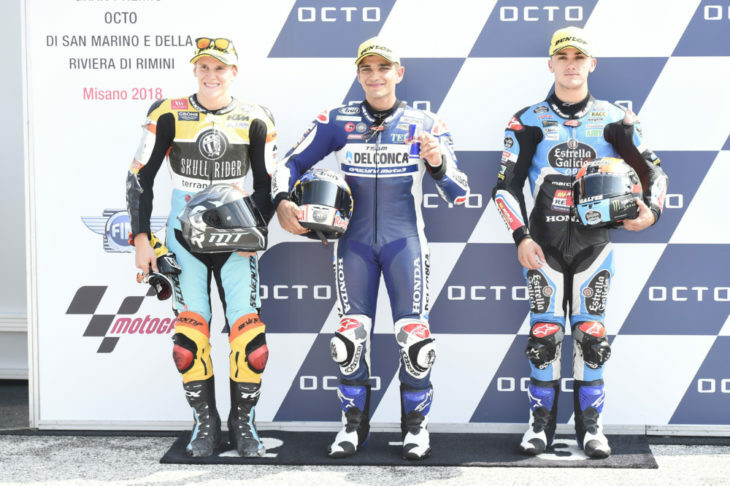 The all-out lap record was smashed also in Moto3, when Jorge Martin claimed his eighth top qualifying time for a 17th career pole start (both also records). The Del Conca Honda rider waited until the end of the session and perfectly judged the gaps in the traffic to depose long-time session leader Gabriel Rodrigo’s RBA KTM to second by three tenths. 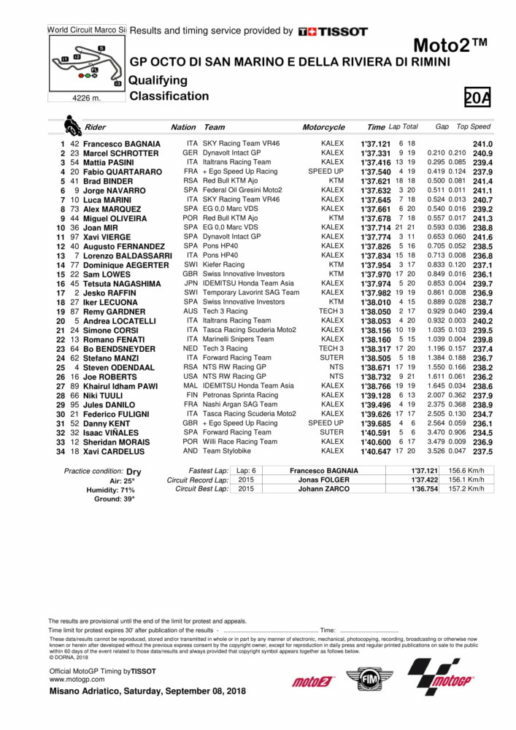 Martin was the first Moto3 rider to lap in less than 1m 42s. A second KTM – Jakub Kornfeil’s Redox bike – was in the top three at the end, only for his lap time to be disallowed. He dropped to ninth, promoting Aron Canet (EG Honda) to third; and moving his own Redox team-mate Marco Bezzecchi back onto the second row in sixth, alongside Enea Bastianini’s Leopard Honda. Bezzecchi currently leads Martin by 12 points. Nicolo Bulega (SKY VR46 KTM) and Lorenzo Dalla Porta (Leopard Honda) head Kornfeil on row three; Ayumu Sasaki (Petronas Honda heads the fourth.